Fresh from a $25 million facelift that gave its staterooms a glamorous dash of retro-meets-modern panache, eight-year-old Crystal Serenity embarked on a series of cruises through the Baltic Sea. Onboard for the most recent 11-day “Jewels of the Baltic” segment, I sampled the award-winning hospitality, service, and cuisine for which Crystal (www.crystalcruises.com) is renowned – all while visiting a half dozen fascinating and historically romantic cities, from Stockholm to St. Petersburg to Copenhagen (shown above at left). Crystal’s cruise product is luxurious from aft to stern (and, accordingly, Serenity fares start at about $675 per person per day), but the line’s attention to quality is evident in everything from the chic new stateroom decor to the delicious and ambitious menus in the seven dining outlets. At 68,870 gross tons and 1,070 passengers, Crystal Serenity (shown at right) is larger than most of its luxury competitors (many of whose ships accommodate 300 to 700 passengers) and it strikes a nice balance between a small and large-ship experience. The crew’s top-notch service gives Serenity a feeling of intimacy while its size gives it recreation options (two pools, two Jacuzzis, paddle tennis courts, and a walking and jogging track that encircles the Promenade Deck) that smaller ships lack. Stateroom Amenities: All 535 staterooms, 85 percent of which have verandahs, have been refurbished in a chic yet serene palette of neutrals (white, ecru, chocolate brown, deep gray) with sophisticated details such as dramatic floor-to-ceiling tufted leather headboards, plush upholstery, and pleasingly patterned carpets (shown at left). The dazzling look, created by Keith Rushbrook of Toronto-based II by IV Design Associates, reminded me of something Candice Olson would whip up on her HGTV show. Mood lighting and high-tech touches add to the feeling of being in a luxurious Manhattan apartment – albeit a compact one. 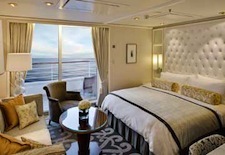 Categories include 226-square foot Deluxe Staterooms (with a picture window rather than glass doors and balcony) and 269-square-foot Deluxe Staterooms with Verandah; 403-square-foot Penthouses with Verandah (shown above at left; they come with a more sizeable sitting area, private verandah, walk-in closet, Jacuzzi tub and separate shower, and butler service); and 538-square-foot Penthouse Suites with Verandah (with a separate living and dining area in addition to the Penthouse amenities). There are also four 1,345-square-foot Crystal Penthouses for guests who can afford a major splurge. All categories feature a flat-screen TV with DVD player, wireless in-room Internet (for an additional fee) Egyptian cotton linens and Frette bathrobes, and a refrigerator with soft drinks and water. Bath products are by Aveda. 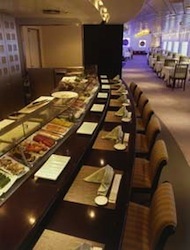 Dining and Entertainment: Serenity’s main dinner venue is the Crystal Dining Room (shown at left), which offers a different menu of excellent international dishes at two seatings (Classic Main at 6:30 or Classic Late at 8:30). 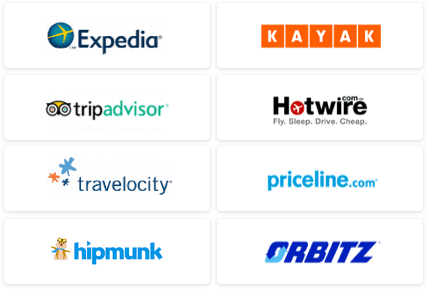 Depending on your preference, you can pre-request a table for two or opt to get to know your fellow passengers at larger tables. 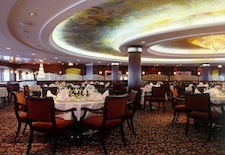 With Classic dining, you keep the same table, tablemates, and waiter for the entire cruise. Or you can choose the more flexible Open Dining by Reservation and select the time and table size on a night-by-night basis. Either way, you will savor the experience. Executive chef Werner Brenner has created a series of deftly executed menus with many standout dishes. Winning appetizers included the Seafood Rendezvous of lemon-oil-poached Coquilles St. Jacques, lobster salad and crab and sweet corn brulée, and the truffled chicken liver parfait with pear confit, port wine gelée and warm brioche. Memorable entrees included broiled rock lobster tail with melted lemon butter served with fresh garden vegetables and saffron rice-pilaf, and the roasted wild pheasant breast with pistachio stuffing on champagne sauerkraut served with sweet corn fritters and cassis sauce. Each menu also includes a salad entrée option (the duck confit salad tossed in sweet-and-sour raspberry dressing was superb) as well as a three-course On the Lighter Side menu for anyone watching their weight. More than a half dozen dessert options await those who scoff at calorie counting. Guests can also reserve a table at one of Serenity’s two specialty dining venues: Silk Road (shown at right), the only sea-going restaurant in famed Japanese chef Nobu Matsuhisa’s worldwide empire (yes miso-glazed black cod is on the menu) or Prego, with an Italian menu designed by restaurateur Piero Selvaggio (of Valentino in Santa Monica, CA) that includes such mouth-watering dishes as slow-roasted pumpkin ravioli. Your taste buds will not suffer at lunch, either, as you can choose the formal ambience of the Crystal Dining Room or go casual at the Lido buffet, the Trident Grill or my favorite, Tastes, where the Chinois chicken salad was utterly addictive. During our two sea days, special Asian and Mediterranean buffets on the Lido deck were exceptional. And when your sweet tooth cries out for an afternoon snack, head for Scoops Ice Cream Bar. After dinner, the vibe onboard is generally pretty mellow (except at the casino, where there’s action until late night). You can catch the late movie (at 10:30pm in the theater), sip a cocktail in one of several bars and lounges, or enjoy a glitzy production show in the Galaxy Theater (don’t miss Curtain Call, a montage of show-stopping Broadway hits). 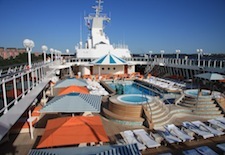 Relaxation and Education: The best place to relax while onboard, whether it’s a sea day or pre-sunset sail-away time, is the newly renovated Pool Deck around the Seahorse Pool (shown at left). With its two Jacuzzis and comfortable loungers, sofas and circular daybeds, all in vibrant orange, green, and blue hues, it’s the spot to order an iced tea or a beer and kick back with a good book (although this being a summer cruise, children did abound). Or if you need to get a few overnight-flight kinks rubbed out, book a massage at the Crystal Spa, the only Feng Shui-inspired spa at sea. The Fitness Center has all the latest machines, as well as a variety of classes, but my favorite place to burn a few calories was the 360-degree Promenade Deck walking and jogging track (where I was lapped by an energetic James Carville, who was the cruise’s guest speaker along with his wife Mary Matalin). My boyfriend and I also enjoyed tempting our long-dormant artistic talents out of hibernation during two watercolor painting classes (inspired by the swirling domes of Russian churches), but given our two sets of left feet, we skipped the ballroom dance classes. Ports of Call: On this 11-day voyage, Serenity called on six dynamic cities, each offering their own mix of history and romance – made all the more special by the “White Nights” of early July when the sun sets (but not really) around 11pm and rises again before 4am. Thank goodness for black-out curtains! The cruise began with two days (and an overnight) in Stockholm, Sweden, one of Europe’s greenest and prettiest cities set on a series of 14 islands. Be sure to walk the Strandvagen esplanade past lavish 19th-century buildings as you make your way to Djurgarden island, home to the amazingly intact Vasa, a 17th-century war ship that sank in Stockholm’s harbor in 1628 and remained underwater for 333 years. Later, stroll through medieval Old Town (Gamla Stan) and past the Royal Palace. The next port was charming Tallinn (shown at right), capital of Estonia, which gained its independence with the fall of the Soviet Union in 1991. A UNESCO World Heritage city, it features photogenic turrets and steeples with German, Swedish, and Russian architectural influences and is easily explored on foot. 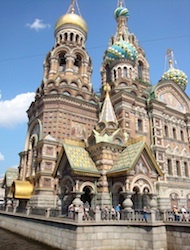 Serenity spent two overnights in St. Petersburg, Russia, allowing for three days of touring. We opted to sightsee via a series of half-day shore excursions run by Crystal (to tour independently, you will need to get a Russian visa before leaving the U.S.) and saw top sights such as The Church on the Spilled Blood (shown at left), The Hermitage Museum, Peterhof Palace and Park, and the Catherine Palace. Next up was Helsinki, another city that’s easy to explore on foot. Don’t miss Senate Square with its towering white Cathedral, the Eliel Saarinen-designed 1909 Art Nouveau train station (he’s the father of Eero Saarinen, who designed the St. Louis Arch), and the Temppeliakio Church, the circa-1969 “Church of the Rocks” dug out of solid rock. From the next port, Warnermunde, Germany, it was a 3.5-hour bus ride to Berlin, but the five hours we had in this historic city that’s now burgeoning with sophisticated energy was worth it. You can walk to the major sights in former East Berlin's Mitte area, which include the Brandenburg Gate, the Reichstag, Museum Island, and the Berliner Dom, and then stop for a beer and a bratwurst in pretty Gendarmenmarkt before hopping the bus back to the ship. The final port was lovely Copenhagen, where the must-see sights include Tivoli Gardens (a stunning 20-acre amusement park built in 1843 in the city center and the inspiration for Disneyland), the Amelienborg Palace (winter residence of the Danish Royal Family), and the Little Mermaid (the iconic 1913 sculpture of Hans Christian Anderson’s famous character). Be sure to try a polse, a Danish hot dog (we liked the one wrapped in bacon) served from carts all over the city. In 2012, this 11-day Stockholm to Copenhagen itinerary is called “Regal Empires," and its sister ship, Crystal Symphony , will make the sailing (Serenity is in the Mediterranean next summer); fares start at $5,890 per person, all-inclusive. 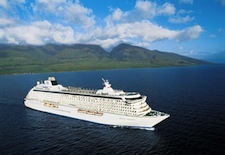 Fares on Crystal Serenity for 2012 start at $4,965 per person for a seven-day cruise. 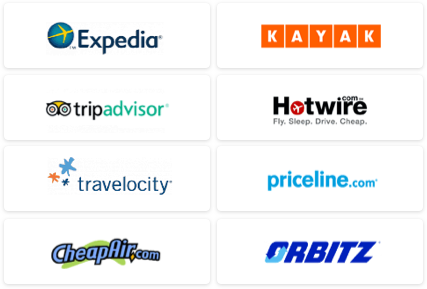 See our Stockholm Travel Guide, St. Petersburg Travel Guide, Helsinki Travel Guide, Berlin Travel Guide, and Copenhagen Travel Guide for more trip-planning information, then use our Travel Search price comparison tool to find the lowest rates on flights, hotels, packages and more travel deals.